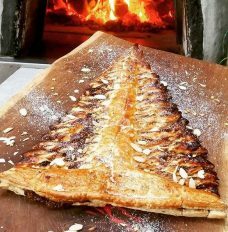 Woodfired Christmas Pastries are perfect to have to offer over the festive season – we love sausage rolls and mince pies. Cooking the pastry in the woodfired oven really puffs them up. Do check out this week’s #woodfiredweekly to see what we do. Let the oven stabilise for around 15-20 minutes while you sort out the sausage rolls. The door wants to sit snugly in the oven entrance, you don’t need to worry about smoke escaping as the embers are all out of the oven. Divide the sausage meat into 4 and roll them out into sausages as long as the pastry. Roll lightly in flour to stop them sticking. Roll out the 2 pieces of puff pastry so they are a bit wider than the rectangle they come in. Cut each rectangle in half lengthways. Put one of the sausagemeat rolls on each piece of pastry. Brush the long edges of the pastry with water and put one of the ingredients – Parmesan, mustard, orange marmalade, chutney – along each of the pastry rectangles. Seal the pastry edges together and roll so that the seam is underneath. Brush each sausage roll with the beaten egg, sprinkle over some sesame seeds, prick or slash the top and then cut into 3-4cm sausage rolls. Put on a baking sheet lined with baking parchment and put them in the oven. Bake the sausage rolls until the pastry is well puffed up and golden brown and the sausage meat is at least 68C when testd with a probe thermometer. About 10-12 minutes. Take the sausage rolls out of the oven and cool slightly before serving. Roll out the pastry so it is about half as big again as when it started. Cut out bases for the tarts with a tart cutter and the same number of lids with a smaller cutter – we managed to get 16 tarts. Place the pastry bases in the tart tin and fill with mincemeat, not too generously in case of bubbling over. Put the lid on the top of each tart and brush with the beaten egg. Sprinkle over some caster sugar or sugar niblets. Put in the oven once the sausage rolls have come out – about 4 Mississippi. Bake for about 10-12 minutes until risen and golden brown and serve while still warm but not boiling hot! Add some herbs to the sausage meat for the sausage rolls. Make some cheese straws – they puff up really well in the woodfired oven. Add some nuts or dried cranberries to the mincemeat for the mince pies. Toast the nuts in your woodfired oven if you have time to get more flavour. Make a big mince pie Christmas Tree, especially if you have a baking session lined up with the kids; they’ll love it!! Serve everything at a party with some woodfired mulled wine. Merry Christmas!